Who is it for? 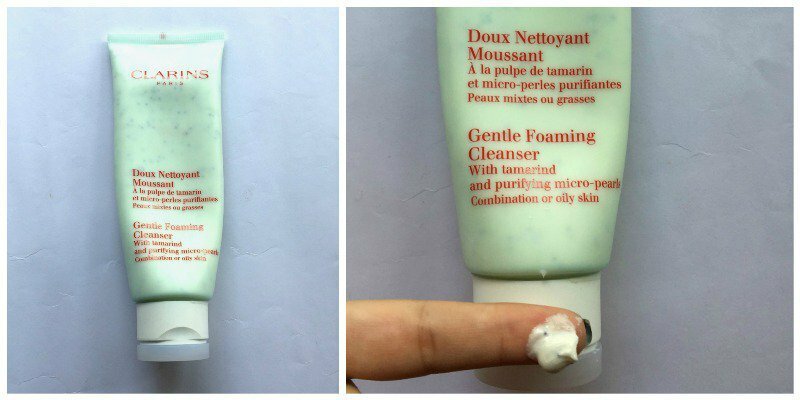 Clarins Gentle Foaming Cleanser is gentle face wash that works perfectly to make your skin look flawless and soft. It comes in a well sealed white colored box. Behind the box, there are instructions as to how to use the face wash. The face wash comes in a tube and lasts for at least 6 months because very little quantity is required to apply of the face. There are different types of face washes in Clarins depending on your skin type. Since my skin is oily and acne prone hence I preferred the ‘ Gentle Foaming Cleanser with Tamarind & Purifying Micro Pearls ‘. It appears light greenish from outside but when you take it out it is off-white with blue colored micro-pearls. It is actually a cream with micro-pearls present in it. The pearls help in deep cleaning once applied on the face. There is no fragrance in particular. I have loved the facewash. It has been over 3 months now since I started using Clarins facewash and it has exhibited terrific results on my skin. Earlier I had pimple breakouts and oily skin but after using this face wash the acne on my skin has reduced and my skin feels fresh and moisturized all day long. Also, it has replaced all the moisturizing creams and serums that I had been using before Clarins came into the picture. It has become one of my must-haves. To all the girls out there who are in search of the ultimate face wash, go ahead and experience it you’ll surely notice a change in your skin after regular applications. Don’t hesitate at all, it will work magically on your skin.